Is there a hole in the phone I can put my cell strap + the attached keychains on? 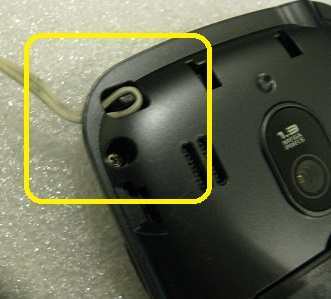 Yes, there's a lanyard hole, in fact a single hole, unlike the usual double hole in other phone such as, for example, the LG 900g, where you slide it through and make a loop on the outside. On the 500g, you have to open the back, slide the lanyard string through the single hole and hook it around a small piece of plastic that sticks up. Once in, putting the back on secures it in place. Actually, it's pretty secure even without the back as I had a heck of a time getting the lanyard back out to put back on my camera. You can see a photo of it above. I think the single hole makes for a cleaner look because you don't have a visible loop on the outside. There is a Service Guide that comes in the box with the TracFone LG500G. It has basic info on how to set up and operate the phone, but lacks much info that must be found elsewhere. Ijust got the LG 500 and couldn't believe there was NO user manual available. A lot about Tracfone minutes etc but not how to use the phone. Your site and FAQ was invaluable. Thanks so much.